We’d love your help. Let us know what’s wrong with this preview of King David by Nancy I. Sanders. David lived an adventurous life. He protected his family s sheep from lions and bears. He fought a giant with just a sling and stone. He even spent years hiding from men who were trying to kill him. And eventually, David became a great king. But David was also a man of God. Learn more about this hero from the Bible and his exciting place in history. Discover what it was like to grow up in ancient Israel and then be a king of God s people. KingDavid part of the Get to Knowseries will teach you everything you need to know about an imperfect young man whom God used to do great things! To ask other readers questions about King David, please sign up. Get to Know King David is part of a series of Get to Know books that are about Biblical people. The books are for grade school age children but I think a wonderful family project for the child (children) parents (or grandparents) to study the Bible together and learn. Get to Know Jesus, Get to Know Mary, Get to Know King David, and Get to Know Apostle Paul. The book begins with David as a shepherd boy and continues when he is King David. There is a lot of history and facts about David and other people from the Bible. It is a short book and can be read by chapters instead of reading the complete book at one time. I suggest the adult read it first so they can be prepared for questions from the child. There are pictures, maps, and drawings to be used as a learning tool. Throughout the book are symbols that have information about the book. Bible Hero- Look for a sandal about information about a Bible hero. Eyewitness Account- Look for a picture of an eye each time someone who saw what happened tells about it. Did You Know?- Look for a clay jar to learn fun facts. Word Bank- Look for a scroll to learn the meanings of new words. The words are also in bold on the page. A Did You Know? : "The Bible has two sections- The Old Testament and the New Testament. These are also known as the Scriptures. The Old Testament tells the history and beliefs of the Jews. The New Testament tells the history and beliefs of Jesus and his followers. )The stories of David are in the Old Testament" (page 16) (Leona's note: Usually I see His with a capital but this was lower case so I left it that way). Jeff and Annette-what a blessing it is to call you family as well as friends. I received a complimentary copy of Get to Know King David by Nancy I. Sanders from booklookbloggers.com. I recommend these as a wonderful Christmas gift or a Jewish holiday. They are not expensive; $ 6.99 is the listed price on the back of the book. -failed attempt at a gospel presentation in the last chapter; sin was not mentioned until the end, nor was the consequences for breaking God's law. This would leave the question "what does the Messiah need to save me from?" Nancy I. Sanders pens a series of books aimed at kids called “Get to Know…,” with this latest book focusing on the Biblical King David. It is recommended by the publisher primarily for ages 6-10, but older readers seeking a summary of David’s life will also find it useful. Over the course of 100 pages, the book charts its course; tracking David from an unknown shepherd boy, his famous confrontation with a giant, rule over the kingdom, preparations for the temple, and a little bit of prophetic vi Nancy I. Sanders pens a series of books aimed at kids called “Get to Know…,” with this latest book focusing on the Biblical King David. It is recommended by the publisher primarily for ages 6-10, but older readers seeking a summary of David’s life will also find it useful. Over the course of 100 pages, the book charts its course; tracking David from an unknown shepherd boy, his famous confrontation with a giant, rule over the kingdom, preparations for the temple, and a little bit of prophetic vison of the coming Messiah. The book is divided into 12 chapters, which are also chopped up with full color pictures and illustrations, as well as bubbles filled with factoids from history and the Bible. This keeps younger readers more engaged, as each page turn is not as likely to lose their attention. It also helps define words that early readers may stumble over. Having read this book through, I am now reading it with my own children. I can recommend this for both family time, and also for devotional or Sunday School environments. When reading at home, I am typically taking one chapter at a time. This serves as a conversation starter as we discuss how it compares to the Bible itself. For instance, my nine year old son pointed out that the author did not mention the part where David cuts Goliath’s head off. Grisly details like this are much more interesting for boys, but if this is a concern for parents, please know the author does not write in a way that might disturb little kids or squeamish adults. For its interesting take on a key figure of the Bible, this book gets five stars. David lived an adventurous life. He protected his family's sheep from lions and bears. He fought a giant with just a sling and stone. He even spent years hiding from men who were trying to kill him. And eventually, David became a great king. But David was also a man of God. Learn more about this hero from the Bible and his exciting place in history. Discover what it was like to grow up in ancient Israel and then be a king of God's people. King David part of the Get to Know series will teach you everything you need to know about an imperfect young man whom God used to do great things! Many know of the story of a little shepherd boy by the name of David that was able to defend his flock against lions and bears with his sling shot. And I bet if you ask them, they can even tell you the story of that same shepherd boy taking down a man by the name of Goliath with a stone, slung from a sling shot. But for many the story ends there. They aren't aware that he ended up being king when he got older. Get To Know:King David, is a great biography on David and his life. This book meant for 9-12 year olds is the perfect book to teach your child even more about individuals from the Bible. This book is not filled with cartoon-like illustrations but actual photographs that lend to the story of his life and makes it that much more vivid. Another great kids book by Nancy I. Sanders, Getting to Know King David is packed full of information about the life and times of the shepherd-boy-turned-king, David. I love this biography series. Each book is a mini-curriculum in itself. There is a glossary/word bank for vocabulary and eyewitness accounts which can act as stepping-off points for further study. The book has several maps and numerous photographs of historical sites and relics. There is a section of “Student Resources” along with Another great kids book by Nancy I. Sanders, Getting to Know King David is packed full of information about the life and times of the shepherd-boy-turned-king, David. I love this biography series. Each book is a mini-curriculum in itself. There is a glossary/word bank for vocabulary and eyewitness accounts which can act as stepping-off points for further study. The book has several maps and numerous photographs of historical sites and relics. There is a section of “Student Resources” along with a selected biography and source notes, all which can be used to deepen your student’s knowledge and understanding of the life and times of King David. As in the other biography that I’ve reviewed, there is a pictorial timeline, showing the events in David’s life superimposed on events in world history. I am fairly familiar with scripture, but there were several things about David’s life in this book that were new to me. Ms. Sanders does a great job of chronicling his life without going into depth about issues that might not be appropriate for young readers, such as David’s lusting after Bathsheeba. She just says that David wanted “another wife”…that gets the idea across without creating issues that parents might not be ready to discuss with their young children. Getting to Know King David is another in a quality biography series for kids by Nancy I. Sanders. I recommend it for anyone looking for a book for their young reader! David lived an adventurous life. He protected his family’s sheep from lions and bears. He fought a giant with just a sling and stone. He even spent years hiding from men who were trying to kill him. And eventually, David became a great king. But David was also a man of God. Learn more about this hero from the Bible and his exciting place in history. Discover what it was like to grow up in ancient Israel and then be a king of God’s people. King David—part of the Get to Know series—will teach you everything you need to know about an imperfect young man whom God used to do great things! KING DAVID (GET TO KNOW) was very interesting. I learned a lot of new things about King David. I didn’t know that he’d snuck into a large city and overpowered it to make it a new capital. I knew he wrote Psalms. I didn’t know about his friend named Jonathon or that Jonathon was King Saul’s son. I recommend this book to anyone who wants to learn more about King David. Ages 6 – 10. Also in the series is: Mary, Jesus, and Paul. Available in paperback. Phone Tree Review: As soon as I got this book in hand, I knew that I would love it. It was so colorful and so visually appealing that it invited me into its pages right away. Because the subject matter addressed David – shepherd boy, psalmist, warrior, worshipper and king, I was certain that it would be interesting. The truth of the matter is that this book is not only interesting, but it is also very thoroughly captivating. With rich details and meaty content, Get to Know King David is a dream Phone Tree Review: As soon as I got this book in hand, I knew that I would love it. It was so colorful and so visually appealing that it invited me into its pages right away. Because the subject matter addressed David – shepherd boy, psalmist, warrior, worshipper and king, I was certain that it would be interesting. The truth of the matter is that this book is not only interesting, but it is also very thoroughly captivating. With rich details and meaty content, Get to Know King David is a dream come true for parents who want to provide their children with a good, solid Biblical education regarding key figures from the Bible. 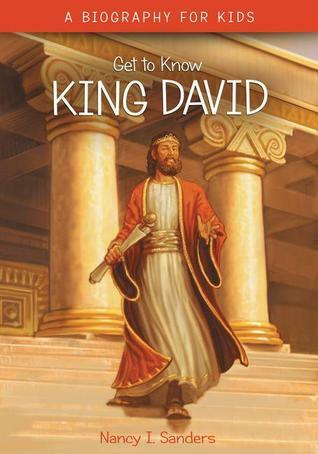 Get to Know King David is a biography for kids by Nancy I. Sanders. What a great book! The book makes it easy for children to understand who King David was and brings to life the Biblical stories about him. I love the vibrant and beautiful pictures. Eyewitness Account - Which is of historians of the time of eyewitness accounts that tell of the time about t Get to Know King David is a biography for kids by Nancy I. Sanders. What a great book! The book makes it easy for children to understand who King David was and brings to life the Biblical stories about him. I love the vibrant and beautiful pictures. Eyewitness Account - Which is of historians of the time of eyewitness accounts that tell of the time about the time King David lived. I think this book is great for kids and adults, as well. I enjoyed reading it. I was quite impressed with it. I look forward to other books in the Get to Know series. I definitely recommend it to children so they can learn about King David. This would be a great book for a Childrens Church teacher, or if you have kids that are about middle school age. It really goes the extra mile to educate kids not only about King David and the Bible, but also in reading and vocabulary skills. Bought to give to my girls but wanted to read it first. Great photos,easy to read text and filled with great information. I enjoyed it.